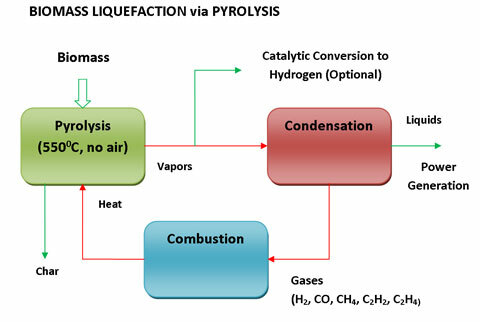 Biomass pyrolysis is the thermal decomposition of biomass occurring in the absence of oxygen. It is the fundamental chemical reaction that is the precursor of both the combustion and gasification processes and occurs naturally in the first two seconds. The products of biomass pyrolysis include biochar, bio-oil and gases including methane, hydrogen, carbon monoxide, and carbon dioxide. Pyrolysis processes can be categorized as slow or fast. Slow pyrolysis takes several hours to complete and results in biochar as the main product. On the other hand, fast pyrolysis yields 60% bio-oil and takes seconds for complete pyrolysis. In addition, it gives 20% biochar and 20% syngas. Fast pyrolysis is currently the most widely used pyrolysis system. Very high heating and heat transfer rates, which require a finely ground feed. Quenching (rapid cooling) of the pyrolysis vapours to give the bio-oil product. 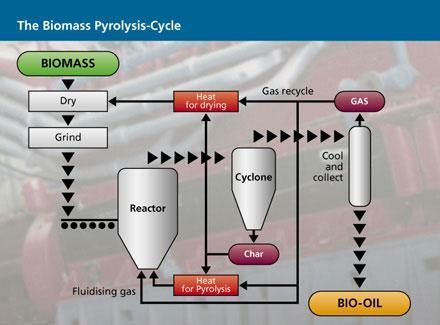 Pyrolysis can be performed at relatively small scale and at remote locations which enhance energy density of the biomass resource and reduce transport and handling costs. Heat transfer is a critical area in pyrolysis as the pyrolysis process is endothermic and sufficient heat transfer surface has to be provided to meet process heat needs. Biomass pyrolysis offers a flexible and attractive way of converting organic matter into energy products which can be successfully used for the production of heat, power and chemicals. Furthermore, the bio-char produced can be used on the farm as an excellent soil amender as it is highly absorbent and therefore increases the soil’s ability to retain water, nutrients and agricultural chemicals, preventing water contamination and soil erosion. Soil application of bio-char may enhance both soil quality and be an effective means of sequestering large amounts of carbon, thereby helping to mitigate global climate change through carbon sequestration. Use of bio-char as a soil amendment will offset many of the problems associated with removing crop residues from the land. Biomass pyrolysis has been garnering much attention due to its high efficiency and good environmental performance characteristics. It also provides an opportunity for the processing of agricultural residues, wood wastes and municipal solid waste into clean energy. In addition, biochar sequestration could make a big difference in the fossil fuel emissions worldwide and act as a major player in the global carbon market with its robust, clean and simple production technology.